1. Heat 1 tablespoon of ghee in a large frying pan over moderate heat. When the ghee is hot, sprinkle in the mustard seeds and fry them until they crackle. Add the minced ginger and chilies, and fry them until aromatic. Sprinkle in the yellow asafetida powder, saute briefly, and pour in the tomato puree. Stir in the turmeric powder and ground coriander. 2. Cook the sauce, stirring occasionally, for 10 minutes, or until a little reduced. 3. Heat ghee for deep-frying in a wok or pan over moderate heat. When fairly hot, deep-fry the cubes of Paneer cheese in batches until they are a light golden brown. Remove the fried Paneer from the ghee, and set it aside to drain. 4. Deep-fry the cubes of eggplant in batches in the hot ghee until golden brown and tender, and set them aside to drain in a colander lined with paper towels. 5. 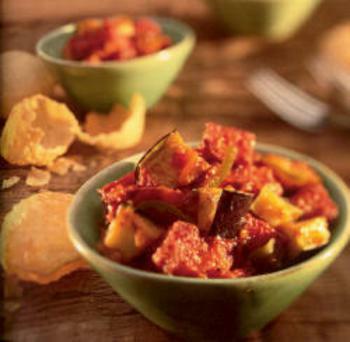 Fold the garam masala, sugar and salt, the fried Paneer cubes and eggplant into the tomato sauce. Serve hot, with fluffy rice or crusty bread.